Just a few years ago, people looking to buy a new pool had two options to choose from; in-ground and above-ground. Within the last 5 years or so a third option has emerged – swim spas (aka all-season pools). This has left many families wondering if they should buy a more traditional in-ground / above ground pool, or if a swim spa would fit their needs better. Today, we will compare traditional pools and all season pools to help you decide which is right for you and your family. One of the first things you should consider when buying any pool is how big your backyard is. 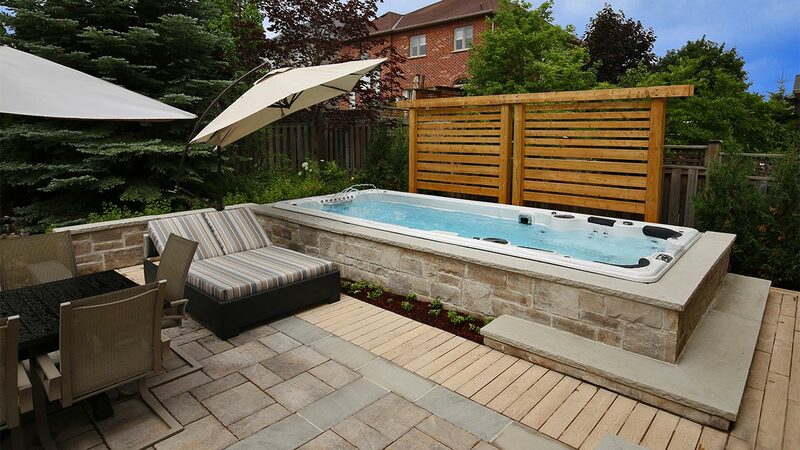 With lots getting smaller and smaller there is simply no room in some backyards for traditional pools. Fortunately, all season pools are compact enough to fit in any backyard; proving a pool option for those that might not otherwise have one. For medium to large sized backyards you have more choice as pretty much any style of pool will fit. When deciding what type of pool to buy, keep in mind that you will likely want room for other outdoor activities. Do your kids have a play structure? Do you have a garden? Do you want to leave room for outdoor sports / games? Do you need room for pets to run around? Keep things like this in mind and make sure that a full sized pool can still fit in the space that remains. Another thing to consider when shopping for pools is how long of a swim season you would like. In the Ottawa area, the average swimming season is pretty short, usually no more than 4-5 months. While you could get a heater for your pool to extend the season out to around 6 months, the cost of heating a traditional above-ground / in-ground pool is quite high; easily costing several hundred dollars per month once overnight temperatures begin to drop. Swim spas, on the other hand, are designed to be used in both warm and cold temperatures. They come standard with built-in heaters and insulation to keep the heat in the water. For this reason, you can very easily extend your swimming season to 8 or 9 months of the year at a relatively low cost. Some swim spa owners even keep their swim spas open all year long! Another thing to take into consideration is how long it will take to install your new pool. Above ground pools typically take 1-3 days to install, fill and get running properly. In-ground pools generally take between 7-21 days to install, fill and get running properly; depending on the finish and size of the pool. These projects can also be delayed by weather, permits – which usually take a week to be issued – and by final inspections; which can delay you another few days. Add to that the time it takes to complete your landscaping and most new pool owners lose half of their swimming season in the first year that they own the pool. All season pools, on the other hand, can be installed in as little as a few hours and are generally ready to use in under 24 hours. They simply require a concrete base to sit on and an electrician to wire them to your home. If you don’t like the above ground pool look, swim spas can also be installed fully or partially in-ground to give you your desired finished look. When it comes to purchase cost, swim spas will end up costing you more than an above-ground pool, but less than an in-ground pool. 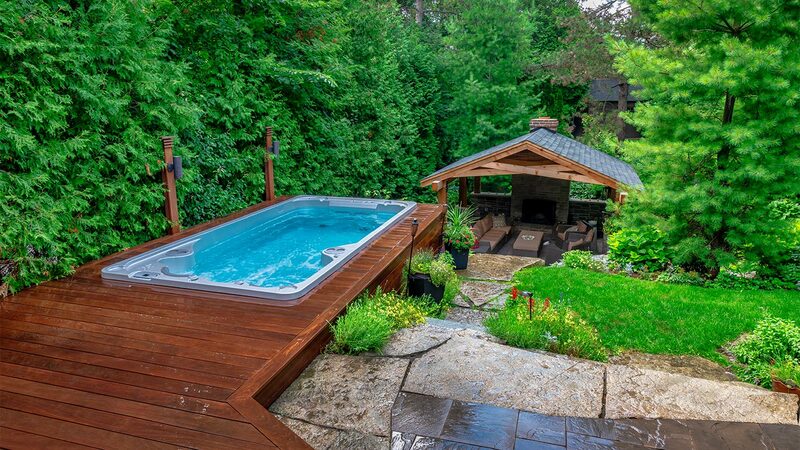 After factoring in the fencing and landscaping costs of traditional pools, however, swim spas can even end up being the less expensive than some above-ground pools. Beyond purchase and installation costs, you also need to consider the running costs of your new pool. To move all of the water in a traditional pool requires a large pump. Large pumps also means large energy bills and the average above-ground or in-ground pool pump will consume around $2-$3 of electricity per day. Heating all of that water isn’t cheap either. Heating bills for in-ground pools can easily reach several hundred dollars per month once the summer heat begins to die down ($5+ dollars per day). This leaves most pool owners with a choice, close down their pool in early September, or pay an arm and a leg to keep it open. Due to the smaller size and thick insulation, swim spas are able to run much more efficiently than other pools. Together their pumps and heater will run for between $1-$3 per day (depending on the time of year). This is less than a regular pool pump consumes on its own and less than half of what it costs to run an average heated in-ground pool! Brushing the walls and floor of the pool to discourage algae growth. Skimming the surface of the water to remove leaves and other floating debris. Self-Cleaning swim spas from Hydropool also include a built-in floor vacuum so you don’t have to worry about vacuuming out the bottom of the swim spa. This means that with a Self-Cleaning swim spa, your weekly maintenance is simply adding a couple of chemicals to the water. If on the other hand you’re buying a pool for fitness rather than for leisure, swim spas offer some unique advantages. Their built-in current systems provide you with a consistent current to swim against that can be varied to match your skill level. The only other option when looking for a fitness pool is to go with a large (preferably rectangular) in-ground pool. Trying to do laps in a small to mid sized pool can be very frustrating as by the time you push off the wall you might only get a few strokes in before having to turn back again. More and more people in Ottawa are buying swim spas rather than above-ground or in-ground pools. While neither is right for everyone, swim spas do offer some unique advantages to people living in the Ottawa area. 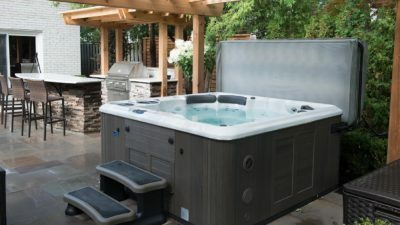 A longer swimming season, less maintenance, more free room in your backyard and lower running costs are just some of the reasons why more and more people have started buying swim spas instead of above-ground or in-ground pools.